This post is part of our ongoing series on Early Christian Authority. 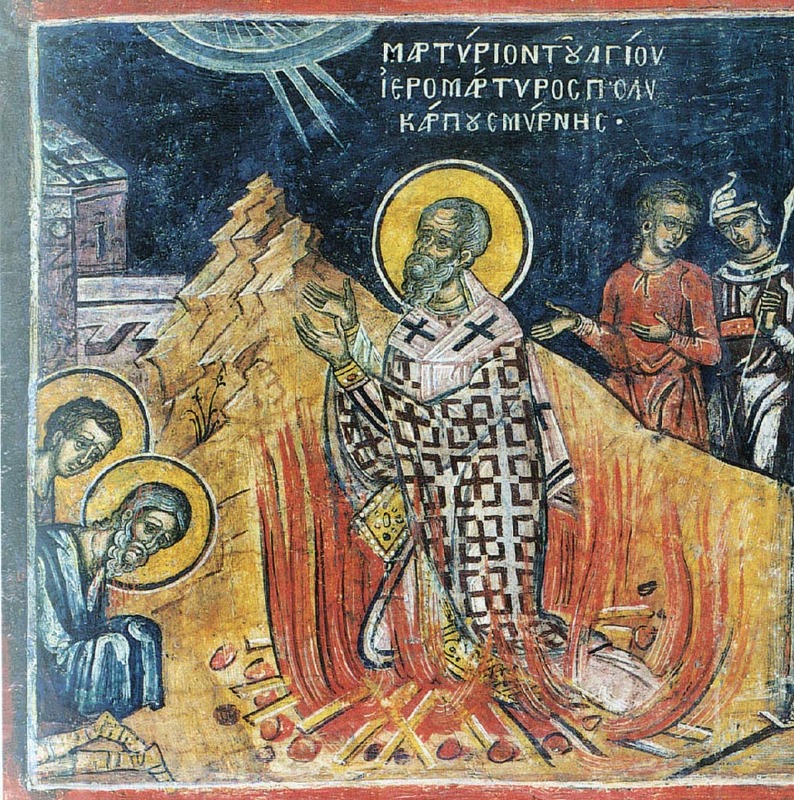 Polycarp of Smyrna remains one of the best attested figures of the early Christian Church. As bishop of Smyrna (cx. Rev. 2.8), recipient of a letter from the Ignatius of Antioch, and a martyr of the church, Polycarp stands apart as an exceptional figure in early Christianity, in that there exists a comparatively good deal of extant material concerning his life. In addition to this letter having been written by the bishop, extant copies exist of Ignatius’ letter to him as well as a later account of his martyrdom. While his Letter to the Philippians has often been looked down upon for its lack of original content and heavy reliance upon other written sources, it remains useful for ascertaining relevant issues within the second century Philippian church and for its use of textual authority. Of notable importance is Polycarp’s concern for rising heretical teachings in the church (7.1; argued by some scholars to possibly be a direct reference to Marcion), his dealing with those who love money (11.1), and his response to the Philippians request for words of righteousness (3.1) with a great deal of practically oriented ethical exhortation. Scholars have long debated the apparent discrepancy between chapters nine and thirteen of this letter. In chapter nine, Polycarp insinuates that Ignatius has died like the apostles. In chapter thirteen however, he requests additional information concerning Ignatius, seemingly unsure of his status. Many scholars suggest that the current letter of Polycarp contains parts of two letters by the bishop, the earliest now being found in chapters thirteen and fourteen and existing as an early preface to the works of Ignatius that Polycarp was forwarding the Philippian church. The second and later letter, coming about twenty-five years later, came in response to a letter from the Philippians. According to this model, these letters were joined together rather early on by a scribe, though much of the later portion of the letter now remains extant only in Latin. Polycarp, like the author of II Clement, cites a large number of early Christian traditions, including passages of Jesus’ words that appear to come from some written source. Cross referencing Bart Ehrman and J.B. Lightfoot’s editions of Polycarp’s letter, one may find up to forty-eight citations of or allusions to written materials. Of these, forty-three are non-formal uses of material, that is, they include no specific introduction to the materials that appear to be coming from written sources. There is one clear use of Old Testament material, one use of material from either the current Old Testament or Ignatius’ letter to the Trallians, one use of Apocryphal material (Tobit 4.11), and four references to material from I Clement. Additionally, there are two uses of material from either current Old or New Testament sources, including the letter’s only use of a highly formal “it is written citation”, which may be found in 12.1 and references either Paul’s Letter to the Ephesians or the Psalms (though possibly both). Polycarp’s main source of materials appears to have been from works now included in the New Testament, as he cites or alludes to such material thirty-nine times, four of which are uses of material introduced by a reference to teaching or speaking. Of these, one references Paul’s teaching (11.2), and three reference the words of Jesus (2.3, 2.3, 7.2), two of which are substantial and accurately preserved enough to necessitate Polycarp’s either having a written document of some form or strong familiarity with such a source. By way of offering some tentative conclusions concerning this letter, it seems clear that Polycarp had access to a written account of at least some of the words of Jesus, most likely Matthew’s Gospel. In the cases where Polycarp cites Jesus material, it clearly stands as authoritative. Paul also stands as an authority for Polycarp, as do his letters, especially the references to the letters to Timothy, the Corinthians, Ephesians, Galatians, and Philippians (possible references to Romans and I Thessalonians also exist). First and possibly Second John are also influential for Polycarp, especially when dealing with heretical teachings. Similarly, I Peter is clearly alluded to several times throughout the letter, as language from Acts. Finally, Polycarp also appears to have access to a copy of I Clement. Polycarp also references a good deal of church structure, clearly designating the teachings of the apostles as authoritative and affirming the appropriate appointment of presbyters and deacons and their qualifications for service. ← What About People Who Died Before the Incarnation?